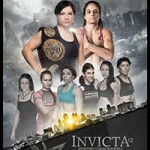 Invicta Fighting Championships held its 12th event tonight at the Municipal Auditorium in Kansas City, Missouri. Invicta FC 12 was headlined by a strawweight championship bout between champion Katja “Killer Bunny” Kankaanpää and undefeated challenger Livia Renata “Livinha” Souza. In tonight’s flyweight co-feature, Roxanne “The Happy Warrior” Modafferi battled Vanessa Porto in a contender’s rematch. Amanda “The Lady Killer” Bell welcomed Faith “The Immortal” Van Duin to the Invicta FC cage in a featherweight bout. MMARising.com has live play-by-play for the card. Referee for this bout is John McCarthy. Souza clinched early on and dragged Kankaanpää to the mat, but Souza wound up on the bottom with Kankaanpää in her guard. Souza attempted a triangle choke from the bottom and scrambled back to her feet soon after. She scored with a huge right hook, but Kankaanpää countered by clinching and held her against the cage. Souza reversed a takedown and hopped on Kankaanpää’s back as the fight hit the mat. She locked on a body triangle and attempted a rear-naked choke. The round ended with Souza landing punches. 10-9 Souza. Close to a 10-8. Both women landed right hands in the second round and Souza countered Kankaanpää’s knees in the clinch by taking her down. A scramble ensued and Kankaanpää wound up on top in Souza’s half-guard. Souza swept and worked from Kankaanpää’s guard by landing short punches. Kankaanpää stood and Souza held her against the cage. The fighters exchanged knees before time expired. 10-9 Souza. Souza landed some hard punches and knees in round three and she jumped guard when Kankaanpää closed in and clinched. Kankaanpää punched from the top and avoided Souza’s attempts to set up a submission. More punches landed for Kankaanpää until Souza scrambled and tried for a kneebar. She used the submission attempt to sweep into top position. The fight returned to the feet and Souza jumped into a flying guillotine choke. Kankaanpää escaped and she finished the round on top. 10-9 Kankaanpää. Kankaanpää was aggressive with punches and knees in the fourth round and Souza pulled guard again. Kankaanpää landed short right hands and worked for a top-side guillotine choke. Souza avoided danger, but Kankaanpää remained on top and she landed more short punches. Souza eventually locked on a triangle choke from her back and she threw elbows to the sides of Kankaanpää’s head. Kankaanpää was unable to hold out any longer and tapped out. Winner: Livia Renata Souza by Submission (Triangle Choke) at 3:58 of round four. She improves to 8-0-0 and becomes the new Invicta FC Strawweight Champion. Referee for this bout is Mike England. The fight began with an exchange of right hooks and leg kicks. More hard kicks landed for both women and Modafferi flurried with punches that led to a clinch against the cage. She landed knees to the body and Porto answered with punches over the top. Porto took Modafferi down and struck from the top, but Modafferi landed elbows from her back. In the dying seconds, Modafferi attempted an armbar and Porto punched free at the bell. Close round. 10-9 Modafferi by a very slim margin. Porto mixed things up with inside-leg kicks, right hands and standing elbows in round two. Modafferi kicked from a distance and followed with single right hands. Porto countered a spinning back kick with a right cross that dropped Modafferi, but Modafferi recovered and the fighters resumed striking on the feet. Porto threw kicks to the upper and lower body, but Modafferi fired off a combination. Porto caught another kick and took Modafferi down. She avoided Modafferi’s submission attempts and the round ended with an exchange of head kicks. 10-9 Porto. Modafferi opened round three with a four-punch flurry and a head kick attempt. Porto landed a series of leg kicks and Modafferi answered with another combination. Porto kicked to the body and she followed with a one-two and a front kick. Both women landed leg kicks and Porto connected with a right cross. Modafferi opened up with body kicks and Porto replied with two more right hands. Porto secured a very brief takedown in the final 15 seconds, but Modafferi stunned her with a hard flurry before the final bell. 10-9 Modafferi, barely. Fight could go either way. Judge Marcus Danforth: 30-27 Porto. Judge Jackson Harper: 30-27 Porto. Judge Brett Miller: 30-27 Porto. Winner: Vanessa Porto by Unanimous Decision (30-27, 30-27, 30-27) after three rounds. She improves to 18-6-0. Referee for this bout is John McCarthy. Van Duin countered Bell’s early aggression by taking her down. Bell attacked with an armbar attempt from her back and Van Duin escaped. Bell tried to roll for a kneebar and Van Duin scored with right hands. She locked on a tight armbar that had Bell in danger, but Bell refused to submit. She avoided a triangle choke and took top position. Bell passed to half-guard and nearly got to side control. She punched from the top, but Van Duin regained full guard. Bell fought free from an inverted triangle choke attempt by punishing Van Duin with vicious hammerfists. She retained top position and transitioned to a heel hook, but Van Duin defended until the end of the excellent round. 10-9 Bell, barely. Van Duin caught a kick and tripped Bell to the mat in round two. In an ensuing scramble, Van Duin locked on a no-hooks rear-naked choke. Bell tried to hold on for as long as she could, but Van Duin tightened her grip and Bell was forced to submit. Winner: Faith Van Duin by Submission (Rear-Naked Choke) at 0:38 of round two. She improves to 7-1-0. Referee for this bout is Mike England. Pa’aluhi threw Gomes to the mat in the opening seconds and took top position in half-guard. She scored with punches, but Gomes scrambled up to her feet and secured a takedown of her own. Pa’aluhi swept and rained down more hard right hands. Gomes attempted a heel hook and Pa’aluhi escaped. She stood over Gomes and continued to land punches throughout the middle portion of the round. Gomes tried for another heel hook and Pa’aluhi defended with punches. 10-9 Pa’aluhi. The second round began with an exchange of power punches and Pa’aluhi threw kicks to the lead leg and body. Gomes scored with a nice right hook, but Pa’aluhi snapped her head back with a straight right. She targeted Gomes’s body with punches, kicks and knees, while Gomes fired back with overhand rights. Pa’aluhi dropped her with a knee to the midsection and she swarmed with punches on the mat. She threw more knees to the body that prompted Gomes to give up her back. Pa’aluhi worked for a rear-naked choke before the bell. 10-9 Pa’aluhi. Gomes reversed a throw in the final round and tried for a guillotine choke. Pa’aluhi escaped, but Gomes took her down into guard. Pa’aluhi countered Gomes’s punches with a triangle choke attempt from her back. Gomes escaped and she landed more ground and pound. Pa’aluhi kicked her off, but Gomes returned to Pa’aluhi’s guard once again. Pa’aluhi worked for more triangle chokes, but Gomes punched her way free. 10-9 Gomes. Judge Marcus Danforth: 29-28 Pa’aluhi. Judge Jackson Harper: 29-28 Pa’aluhi. Judge Brett Miller: 29-28 Pa’aluhi. Winner: Raquel Pa’aluhi by Unanimous Decision (29-28, 29-28, 29-28) after three rounds. She improves to 5-4-0. Referee for this bout is John McCarthy. Morgan used her reach advantage to land long punches and front kicks early on, but Walker cracked her with three looping hooks. Neither fighter landed anything substantial in the middle of the round and Morgan missed with kicks. Walker landed a brief flurry and a right hook the body. Uneventful round. 10-9 Walker. Walker landed overhand rights in the second round and she held Morgan against the cage. Morgan eventually broke free and landed kicks and a one-two, but Walker rocked her with a big combination. Morgan recovered and Walker scored with another powerful right. She finished the round with a three-punch combo. 10-9 Walker. Walker put together combinations to the head and body in the final round, but Morgan closed the distance and tried for a standing rear-naked choke against the cage wall. Walker broke free and she kept Morgan on the defensive with punches. Walker began to taunt her opponent as Morgan retreated and circled away. In the final minute, Walker mixed in front kicks and connected with more right hands. 10-9 Walker. Judge Marcus Danforth: 30-27 Walker. Judge Jackson Harper: 30-27 Walker. Judge Brett Miller: 30-27 Walker. Winner: Latoya Walker by Unanimous Decision (30-27, 30-27, 30-27) after three rounds. She improves to 5-0-0. Referee for this bout is Mike England. Shriver opened the fight with kicks, but Schuckman rocked her with a solid combination of left and right hooks. She hurt Shriver with a big right hand and followed with knees and punches as Shriver wilted against the cage. Schuckman blasted her with more hard shots until the fight was finally waved off. Winner: Lacey Schuckman by TKO (Punches) at 1:53 of round one. She improves to 11-8-0. Referee for this bout is Mike England. Jacobson rushed in and stunned Owen with lead right hooks right away. She kept the pressure on with more punches, but Owen landed counter hooks in return. Jacobson took her back on the feet and Owen pulled her to the mat with a kimura attempt. Jacobson freed her arm and dropped punches from the top. The fighters stood and Owen dropped Jacobson to a knee with a looping right hand. She punished Jacobson with more punches and Jacobson’s right eye swelled up. She took Owen down and landed hard elbows from the top. Very close round. 10-9 Jacobson, barely. Both women scored with quick flurries in round two and Jacobson took Owen down. Owen attempted an armbar and returned to her feet. Jacobson powered Owen down to the mat again and dropped punches while standing over her. Owen worked for a triangle choke from her back, but Jacobson escaped into side control. She attempted a kimura, then mounted Owen and dropped elbows until the bell. 10-9 Jacobson. Jacobson backed Owen up with lead right hands and leg kicks early in the final round. The fighters clinched and Jacobson threw knees to the body. She followed with a lengthy combination and kept Owen pinned against the fence. Owen rocked Jacobson with a big flurry of punches, but Jacobson shot in for a takedown. She wound up on top in side control and threw knees to the body as Owen tried to stand. Jacobson locked on a guillotine choke from the top in half-guard, but Owen escaped. Jacobson peppered her with elbows and forearm strikes in the dying seconds. 10-9 Jacobson. Judge Marcus Danforth: 30-27 Jacobson. Judge Jackson Harper: 30-27 Jacobson. Judge Brett Miller: 30-27 Jacobson. Winner: Sharon Jacobson by Unanimous Decision (30-27, 30-27, 30-27) after three rounds. She improves to 3-1-0. Referee for this bout is John McCarthy. Sinn mixed up her strikes with jabs and leg kicks early on, and she followed with right hands. Sinn closed in and landed knees to the body as Riordon countered with looping hooks and uppercuts. Elbows were exchanged over the top and Sinn attempted a standing arm-triangle choke. She continued to win the striking battles with punching combinations and body kicks. She snapped Riordon’s head back with crisp right hands in the final minute. 10-9 Sinn. Sinn backed Riordon up with a counter combination in round two and she followed with knees and uppercuts in the clinch. Riordon finally landed a flurry of her own and she scored with knees to the body soon after. Sinn put together more combinations and she avoided many of Riordon’s punches, but Riordon bloodied her nose with a one-two. The fighters traded more punches and Sinn landed right hands. Close round. 10-9 Sinn by a slim margin. Riordon pressed forward with punches and front kicks in the final round as Sinn circled to the side and picked her shots with counterpunches. Sinn landed a hard knee to the body and ate a front kick to the face. Power punches were exchanged and Sinn scored with a one-two. Riordon remained the aggressor, but Sinn countered nicely and she threw knees to the body in a clinch against the cage. Sinn landed a spinning back kick to the body and knees in close as Riordon punched over the top. She tried for a takedown before the bell. 10-9 Sinn. Judge Marcus Danforth: 30-27 Sinn. Judge Jackson Harper: 29-28 Sinn. Judge Brett Miller: 29-28 Sinn. Winner: Shannon Sinn by Unanimous Decision (30-27, 29-28, 29-28) after three rounds. She improves to 2-2-0. Referee for this bout is John McCarthy. Begley pawed out with jabs in the opening minute and Eubanks threw occasional leg kicks from a distance. Quick punches and leg kicks were exchanged and both women landed. Begley flurried in close and Eubanks countered with a body kick. A hard knee scored for Begley, but Eubanks took her down against the cage. She threw punches and hammerfists as Begley turtled on the mat. Eubanks postured up and rained down rapid-fire punches until the fight was stopped just before the bell. Winner: Sijara Eubanks by TKO (Punches) at 4:59 of round one. She improves to 1-0-0.